There are several globe front sight and Soule rear sight manufacturers that are popular with BPCR shooters (i.e. Montana Vintage Arms, Sharps, Ballard, Pedersoli, Winchester, and Steve Baldwin). Three of the more recent entries are the Kelley Soule rear sight, the Hoke Long Range Rifle Sight from Kermitool, Inc., and the Ukrainian-made target sights offered by Parts Unknown Inc.. The Davide Pedersoli Company sells more Sharps, Rolling Blocks and Trapdoor BPCR Rifles in one year than all BPCR manufacturers combined. They also sell Creedmore and Soule Tang sights, front sights and accessories through their distributors and dealers. See them listed under our Resources & Links page. In addition, the same company that made the front and rear sights for Browning’s line of BPCR rifles is now offering those same sights directly to consumers. Go to www.advancemfgtech.com for information about pricing and availability. Some rear sights come with standard eye cups (fixed aperture). Many shooters choose to replace their fixed aperture eye cup with the adjustable aperture Hadley eye cup. Montana Vintage Arms (M.V.A.) manufactures what they call the “MONTANA MAGNUM” adjustable aperture “eyedisc”. It has a larger selection of openings for you to choose from than standard Hadley eye cups. Pedersoli also has an "adjustable diopter eye piece" available through www.cabelas.com. What you have to keep in mind is to order the proper size (10-32 or 10-40) thread when you order any new eye cup. Which one you order will depend largely upon the manufacturer of your rifle or the maker of your set of rear sights. Another thing to remember when replacing your front globe sight is to pay particular attention to the measurement from the bottom of the dovetail to the centerline of the sight insert. This will affect your rear sight elevation settings and you might end up with the eye cup too high for comfort. Also check the dimensions of the dovetail slot in the top of your barrel. Shiloh Sharps’ front sight dovetail is .450” while C-Sharps’ is 7/16”. Other rifle manufacturers, especially European makers, may use metric dimensions on their front sight dovetails. Front sights for Long Range BPCR should have replaceable front inserts with an inside diameter of .085 thru .155. Sights such as those that came with the Browning BPCR rifles use the Lyman 17A style inserts. Both Lee Shaver and Ron Snover offer their own version of the 17A insert. An excellent source for these sights and inserts is Buffalo Arms Co. (208-263-6953). My personal preference for sight inserts is a heavily outlined insert like those offered by Ron Snover. 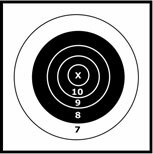 His sight insert card is available from IXL Enterprises (423-234-0184). The front globe sight made by Steve Baldwin has a unique feature that many shooters appreciate — the spirit level is located inside the globe which provides added protection from damage or glare. The sight comes with twelve inserts, but they are not interchangeable with any other manufacturer’s inserts and are not heavily outlined. You can reach Steve Baldwin at Mechanical Accuracy, Inc. (405-399-2875).